Our WordPress hosting uses a bespoke NGINX configuration for super fast speeds. Your website will benefit not only from our SSD powered servers but also the optimised platform that sits behind your WordPress Website. Load times will be super fast for users visiting your website. Ideal for hosting more than 5 WordPress sites on a fast SSD platform. Our WordPress platform includes artificial intelligence (AI) to detect and classify potential ‘evil’ automated requests. Any brute force attempts to access your site are quickly prevented and blocked. We use the latest PHP7 versions available to benefit from PHP-FPM resource pools. Each WordPress site hosted on our platform uses its own PHP-FPM pool to allow it to run quickly and efficiently. Your WordPress install will include a built-in cache plugin to allow you to manage the cache that sits underneath your WordPress website. No need for additional cache plugins like W3Total, WPCache etc. Our WordPress platform uses an optimised version of NGINX together with OPcache which will cache requests that are ready for the next website visitor. The platform is also tuned to allow MySQL to perform as quickly as possible with the minimal amount of requests and operations required for a fast WordPress site. As standard your WordPress sites will be automatically updated to the latest WordPress versions & patches as soon as they are released. This will ensure that there are no vulnerabilities and bugs for hackers to inadvertently gain access to your website(s). Each mailbox is 10GB as standard no matter how many mailboxes you have and its not counted towards your allocated plan disk space which is entirely separate. We include FREE wild card SSL certificates for you to secure all your WordPress sites that your web hosting package has. No need to pay for a standard SSL again. Our WordPress hosting platform uses SSD disk storage providing your site load times. SSD drives provide better performance, reliability and durability over a traditional HDD. NO questions asked and instant refund guaranteed. 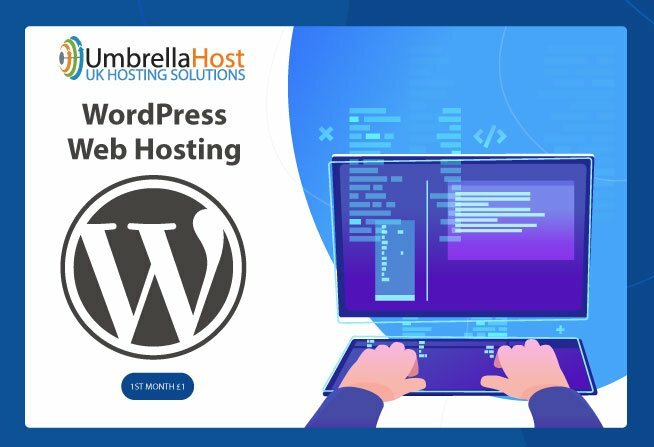 Your WordPress website hosting plan with Umbrella Host comes with all the features you need to get your site up and running fast. We dont limit our features. The only difference in our WordPress hosting plans is the amount of WordPress sites, disk space and bandwidth that you need. Everything else is included as standard. How Many Installs of WordPress Can I Have? Can I Install Additional Apps? How does the WordPress Plugin Work? Do I Need OR Can I use another Cache Plugin? Will your prices change? Can I upgrade my plan? Are There Any catches with The 1 Month Offer? By default there will be only 1 WordPress install. This is based on the WordPress Multi-site network. You can then create as many sites as allowed by your plan to the WordPress multi-site installation. This also includes sub domains. You cannot add in multiple installations of WordPress at the moment, although this is something we are looking at providing in the future. If this is what you need then our Linux or cPanel plans will be better suited to your needs. No, as this is an optimised WordPress platform so you won’t have the ability to install additional apps. You can add in scripts/apps manually however we cannot guarantee that these would function properly as the platform is optimised for WordPress only. If you need to add in additional apps/scripts then we suggest you look at our Linux or cPanel hosting plans which will allow you to do this. The WordPress plugin is automatically installed when we setup your WordPress install. It will allow you to manually manage the cache that resides in our optimised wordpress Platform. This is an advanced feature which allows you to managed your cached content manually should you need to. There is no need to use another cacahe plugin with your WordPress site like W3 Total Cache, WP Super Cache, WP Fastest Cache etc. As we use an optimised WordPress platform with NGNIX & OPcache your sites cache is handled at as server level giving you best cache possible. there is no need to bloat your WordPress site with additional plugins as the platform handles everything. We include a cache management plugin with our WordPress installs so you can manage the cache manually if required. No, none at all. The pay ‘£1 for the first month’ offer applies to our monthly pricing plans. It allows you to fully use our web hosting without restrictions. we are confident that once you experience our web hosting you will continue with your hosting. If you are unhappy then of course you can cancel at any time within the first month. We will also provide you with a refund as part of our money back guarantee so you really have nothing to lose. The offer inst available on our annual plans as those plan prices already include a 10% discount.